Love them, buy them, toss when grungy. Squash down the heels and wear like mules. Choose oddball colours. Have another panachée. Unbutton the extra button, wear hibiscus polish, take a siesta. Not shoes for all day sightseeing– though they do have more sole than paper-thin ballerinas. If you want to espa-up in your fresh pedicure, pick open-toed ones. They stow well in a bag, live happily on a boat and best of all, you can choose your colours from a variety of vendors. Bistro dinner: The Bernarda from Espadrillesetc. Just enough height for dresses, and look at that merry stripe! Price, $56 plus s&h. Trip to the market: Mariola, shown in blue denim, comes in a bouquet of hues, with a slight (1 1/2 inch) wedge; price, $32, from Espadrillesetc. Game of bocce: Simple flat espadrilles from Ropey Soles, a UK site. Shown, their simple model in "jeans", price, £11.99. I've had excellent customer service from this company. Lawn party: Open-toe two-inch wedge in orchid, from Ropey Soles; price, £24.99. For the entire family: With sizes up to EU48, another UK firm, Espadrille, puts casual chic on everyone's foot. This classic turquoise pair is £18. 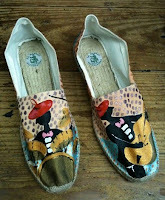 Jazz bar: Hand-painted espadrilles produced to your specifications by a Barcelona cartoonist and artist, Kookookookie. Contact Mr. K. for prices and see his site for inspiration. Insouciant, inexpensive, eco-friendly: the signature of summer in a little canvas shoe. I like its American cousin, the Converse, too, but espadrilles are definitely more feminine in their flirtier varieties. I'm preparing an order, to summon the glorious season just over the horizon of a cold, sleety spring. 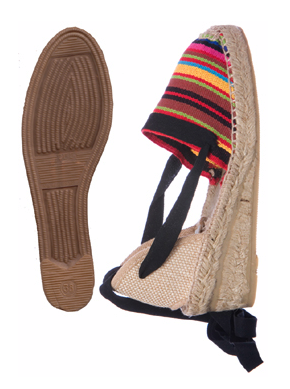 Pseu: I've also seen "fake espadrilles" by Stuart Weitzmann, basically wedges with rope trim around soles. If you wear them poolside, support not as important. They *are* lovely. And JJill has a few nice pairs this spring, also. However, I gave them up years ago, because I never can seem to coordinate my wear with a completely dry day. One raindrop, and they're through. So yes, cheap is essential! We're leafed out here and tulips are blown, but my friends in Montana and Michigan are still experiencing snow. Hang in there, dear Duchesse. Wearing these beach and pool worthy shoes must surely guarantee great weather, Non? 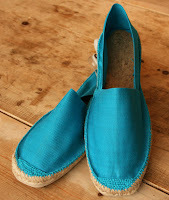 I adore espadrilles and need to refresh my summer supply. Thank you so much for the fabulous resources. dana: Though it might depend on the construction I have had excellent results drying mine on shoe trees in natural air (porch). We have sleet today, need all the encouragement I can get! hostess: Not a beach person so wear mine to lunch or dinner- really anything but walking for miles. mardel: I ordered from RopySoles, and two pair for Le Duc. 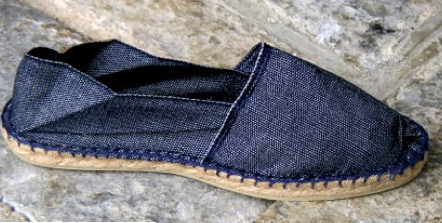 I love the denim espadrilles. It's time to start shopping for this summer's poolside wardrobe. I enjoy my Toms, which are not as pretty as these espadrilles, but support enough to running around town. Belle: Funny, never think of them as pool shoes, probably b/c do not have a pool. Susan: Toms have very similar uppers as the classic espadrille. I found beautiful espadrilles at Zappos from Vidorreta and Eric Michaels. I'm on my second season with them, in Seattle no less, and they are still in great condition. A little pricier, but a lot of variety with color, heel height and fabric with both brands. And they bring back so many memories of fun things like France, and youth, and the seaside:). LAM: I looked at the shoes on Zappos. Eric Michael's "Jake" is a classic espadrille, made in Spain, for $93. Seems pricey compared to sources I've shown (but you do get frees shipping) and companies like Espadrillesetc. offer many colours. The Michaels shoes shown on the site this season are not espadrilles, but have rope sole trim. LPC: Even a parcel in the mail from Spain, France etc. makes me happy. I totally get that espadrilles are the hot fashion item for this summer, but have too many bad memories about these shoes. The rope soles make the shoes inflexible and heavy; the canvas uppers do not stretch and can cut into your skin or rub blisters. If I were to get into this trend, it would be with a rope-trimmed sandal or wedge heel shoe with a leather upper. abetterme: Hot fashion- are they?! They've been around forever, with the limitations you describe but the jute soles are now coated with a thin layer of rubber. They are a retro shoe, definitely. Duchesse, I know you are a fan of Arche shoes. I bought wedge sandals with a criss cross strap across the vamp in a lovely taupe nubuck. I found the Paris store near Place Madeline and felt like a kid in a candy store. I have two other pairs ordered on line last year. Just love them. I have the dreaded high instep problem with slip ons. Tried on Repetto ballerines, but no way. Totally unwearable for me, paper thin soles and zero support. Ah well. I remember espadrilles as a college wardrobe staple. Thanks for the sources! Marguerite, I'm glad Arche works for you. Some seasons the styles are better than others, but *anyting* has more support than the Repetto ballerine. Cole Haan make a ballerina with an arch. The best feature for me is that the nubucks are washable (in a mild solution such as Ivory). I brush them with a soft brush (like an old toothbrush) and dry naturally with shoe trees in them. Look like new!